AdBlue technology is appearing in newer diesel cars and vans to help reduce harmful exhaust emissions. AdBlue® is a colourless solution that helps convert harmful nitrogen oxides (NOx) gases into harmless nitrogen (N) and water vapour (H2O), reducing road pollution. The newer the diesel vehicle, the more chance it uses it. But it does depend on manufacturer and model - not all diesel cars use AdBlue® technology. If you haven’t spotted a blue capped AdBlue® refill point next to the fuel cap, in the engine bay or even the boot, then check your owner’s manual. Or just ask, we can check for you. It’s important not to run low, or run out of AdBlue as your vehicle can go into limp mode or even fail to start. If you’re not sure how much AdBlue your car needs, we recommend booking a 4 litre top-up online – you can always purchase additional 4 litre increments in centre. 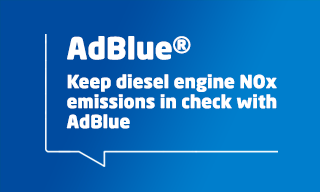 AdBlue® is a colourless solution used in many newer diesel vehicles to reduce harmful exhaust emissions.